Pain is an inevitable part of life. It may arise as a result of illness or injury, and may be acute or chronic in nature. As the world’s first smartphone pain assessment and monitoring device, PainChek® uses Artificial Intelligence (AI) and smartphone technology to give a voice to people who cannot verbalise their pain. 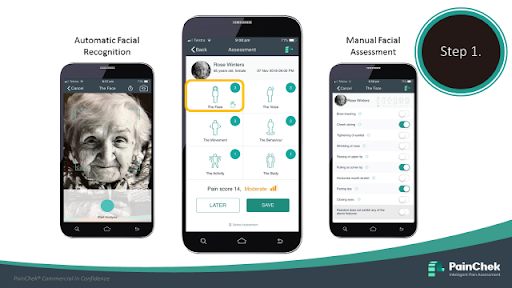 Chief Scientific Officer at PainChek, Jeff Hughes, looks at how the organisation’s assessment tool can help identify and analyse pain in the elderly and dementia patients. The response to pain is varied, and as such pain may manifest in more than just a physical sensation, impacting on an individual’s emotional and mental well-being. As people age, the likelihood of having an underlying painful condition or disease increases. So too does the incidence of dementia; rising from around 1 in 10 people aged over 65 years to 1 in 3 at 85 years and over. With this in mind, PainChek was developed with the primary aim of improving pain management in people with dementia by improving pain assessment. PainChek (formerly known as the electronic Pain Assessment Tool or ePAT) utilises both smart automation and artificial intelligence (AI) in a point-of-care app, in combination with a secure web-based admin portal and data repository. As Pain Australia points out, although two people may have the same pain condition, their experience of living with pain can be vastly different. This experience may be influenced by many things including attitudes, beliefs, personality and social factors, which is why it’s important to know what impact the pain is having on the individual’s ability to function physically and emotionally. The PainChek tool, which is now used nationally by Dementia Support Australia and more than 50 aged care facilities in Australia and New Zealand, conducts pain assessments across six domains - face, voice, movement, behaviour, activity and body. The domains contain 42 items based around the American Geriatric Society’s behavioural indicators of persistent pain in people with cognitive impairment. The face domain utilises automated facial recognition and analysis to detect the presence of facial micro-expressions, also known as action units (AUs). The individual’s face is filmed for three seconds, during which time the AI identifies the presence of nine pain-related AUs. The app user then records observations of pain-related behaviours, such as how the person is moving and vocalising pain, in the five other domains. The tool sums up the number of items detected to provide a total pain score and automatically assigns a pain intensity. Over time, the app provides a record of a person’s pain scores and their response to pain management, giving a more accurate picture of how pain affects an individual. PainChek stores results, allowing caregivers to monitor the effect of medication and treatment over time. Through the dashboard on the admin portal, providers can also view a range of analytics including the number of active users, residents assessed, assessments undertaken and pain levels. These features provide a means of demonstrating pain assessment practices and management outcomes over time with an individual institution, which are beneficial data for auditing and (re-)accreditation purposes. In part two we will learn more about PainChek’s use in clinical practice and hear experiences from current users. PainChek is a medical device and received regulatory clearance in Australia and Europe in July 2017. These clearances were supported by clinical trial results which showed PainChek to have excellent validity, reliability, accuracy and clinical utility when used to assess pain in aged care residents with moderate to severe dementia when compared blindly with Abbey Pain Scale - currently a widely used tool for measurement of pain in people who cannot verbalise.